In music, flat, or bemolle (Italian for “soft B”) means lower in pitch. Flat accidentals are used in key signatures of F major / D minor and so on. 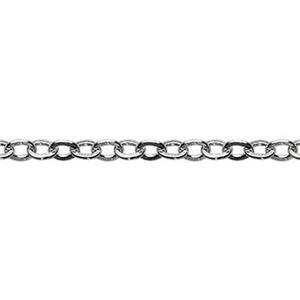 This little, Italian sterling silver 1.3mm flat cable chain is just that – meant to be used in your key signature jewelry pieces. It will play brightly, beautifully. The inner diameter of the chain link is too small for the traditional placement of jump rings. Even 24 gauge wire will be too large. You will need to finish these chains by soldering on an endcap or jump ring.